Whenever there is a talk about metallic nail art designs, it is always the black and gold that works great. This is true if the black shade is matte. Matte black nails stand out from the rest and the black shade never goes out of style. This particular design is good if you are looking to get acrylics. The rose gold polish is achieved by adding mirror powder onto the light pink base. The accent nail can be added of your choice be it the ring finger or thumb or even both. You can decorate the nails with rhinestones or small beads for an attractive looking nails. This metallic nail design is a piece of art that requires the services of a skillful professional. The artist has mixed three different shades and created an attractive looking nail design. 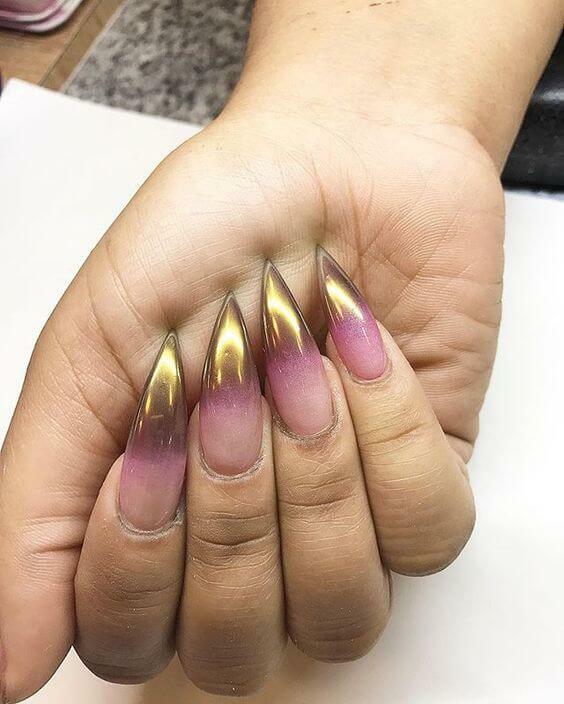 The artist has blended clear, magenta and gold reflective nail polish into a perfect gradient. Top it with long pointed tips and get ready to get some nice complements. If you don’t like metallic nails all over, then the Ombre tip nails are a good change. These fancy looking nails standout from the rest. You can use a triangular makeup sponge to dab on the area you want the more tip to start. You can keep adding more according to your preference to build up the overall look. This metallic nail design is perfect for anyone who wishes to look like mermaids. This design is inspired by the metallic hues of mermaid tails and fish scales. Add the magic of sea in your life with the mermaid metallic nails. To make the nails memorable, shape your nails into pointy claw shapes. Marble nails are equally beautiful as the metallic nails. Clever combination of color of the season, rose gold makes the marble finish stand out. The overall feel of the nail design is stylish, sophisticated and glamorous. Love precious metals, then it’s time to take some inspiration from world’s favorite precious metal and get this golden broken effect. You don’t have to use gold leaf to achieve this effect if you are trying at home; instead use anything from gold stickers to gold nail foil. Nicely place the gold flakes over the black background and set them in place with a quality top coat. This metallic nail design does not require expertise to create. All that you need is nail polish with reflective metallic properties. There are various brands in the market that make these types of nail polishes. Use a normal base and top coat and you are ready to steal the show. French manicure is a classic, but you can give it a modern twist. This nail design is ideal for work, interviews or any other occasion by making a style statement, without going overboard. Pick a gray or dark nail polish to get this look that is glossy to create a nice contrasting appearance with metallic silver tips.